Dopamine has been associated with risky decision-making, as well as with pathological gambling, a behavioral addiction characterized by excessive risk-taking behavior. However, the specific mechanisms through which dopamine might act to foster risk-taking and pathological gambling remain elusive. Here we test the hypothesis that this might be achieved, in part, via modulation of subjective probability weighting during decision making. Human healthy controls (n = 21) and pathological gamblers (n = 16) played a decision-making task involving choices between sure monetary options and risky gambles both in the gain and loss domains. Each participant played the task twice, either under placebo or the dopamine D2/D3 receptor antagonist sulpiride, in a double-blind counterbalanced design. A prospect theory modelling approach was used to estimate subjective probability weighting and sensitivity to monetary outcomes. Consistent with prospect theory, we found that participants presented a distortion in the subjective weighting of probabilities, i.e., they overweighted low probabilities and underweighted moderate to high probabilities, both in the gain and loss domains. Compared with placebo, sulpiride attenuated this distortion in the gain domain. Across drugs, the groups did not differ in their probability weighting, although gamblers consistently underweighted losing probabilities in the placebo condition. Overall, our results reveal that dopamine D2/D3 receptor antagonism modulates the subjective weighting of probabilities in the gain domain, in the direction of more objective, economically rational decision making. Dopamine has been implicated in risky decision making and gambling addiction, but the exact mechanisms underlying this influence remain partly elusive. Here we tested the hypothesis that dopamine modulates subjective probability weighting, by examining the effect of a dopaminergic drug on risk-taking behavior, both in healthy individuals and pathological gamblers. We found that selectively blocking dopamine D2/D3 receptors diminished the typically observed distortion of winning probabilities, characterized by an overweighting of low probabilities and underweighting of high probabilities. This made participants more linear in their subjective estimation of probabilities and thus more rational in their decision-making behavior. Healthy participants and pathological gamblers did not differ in their risk-taking behavior, except in the placebo condition in which gamblers consistently underweighted losing probabilities. A wealth of animal and human studies has implicated dopamine in risk-taking behavior. Pharmacological studies in rodents have shown that drugs blocking dopamine D1 and D2/D3 receptors generally decrease risk taking, whereas drugs enhancing dopamine D1 and D2/D3 receptor activity generally increase risk-taking (St Onge and Floresco, 2009; Zeeb et al., 2009; St Onge et al., 2010; Barrus and Winstanley, 2016). Similarly, in humans, boosting dopaminergic transmission with drugs such as L-Dopa and D2/D3 receptor agonists has been shown to increase risk-taking behavior (Riba et al., 2008; Djamshidian et al., 2010; Voon et al., 2011; Rutledge et al., 2015; Rigoli et al., 2016). Furthermore, studies in both humans and animals have reported that variations in dopamine levels due to genetic manipulations or natural variations in the expression of the dopamine transporter gene are associated with changes in risk preferences (Mata et al., 2012; van Enkhuizen et al., 2014). Yet, the specific neurocognitive mechanisms through which increased dopaminergic transmission would increase risk-taking behavior remain partly elusive. Some studies have suggested an influence via reward valuation mechanisms (Zhong et al., 2009) while other studies have shown that this influence is exerted via a change in value-independent gambling propensity (Rutledge et al., 2015; Rigoli et al., 2016; Timmer et al., 2017). Here, we focus on a less well-investigated hypothesis, which is the role of dopamine on the subjective weighting of probabilities, both in healthy participants and individuals suffering from pathological gambling, a psychiatric disorder characterized by excessive risk taking. A useful and popular framework for examining how dopamine influences probability weighting is prospect theory (Kahneman and Tversky, 1979). Prospect theory posits that the departure of human agents from rational economic decision-making (i.e., expected value maximization) results from diminishing sensitivity to outcome value on the one hand and nonlinear weighting of probabilities on the other hand. People typically overweight low probabilities and underweight moderate to high probabilities, which results in an inverted-S-shaped probability weighting function and a diminished sensitivity to changes in probabilities in the medium range (Fig. 1B). A previous PET study in humans has shown that the degree of nonlinear probability weighting in the gain domain is correlated with striatal dopamine D1 receptor availability across subjects (Takahashi et al., 2010). Work with fMRI has also shown that probability distortion is accompanied by similarly distorted patterns of striatal BOLD activity (Hsu et al., 2009). Here, we aimed to establish a causal link between dopamine and probability distortion using a pharmacological manipulation. The gambling task and the probability weighting function of prospect theory. A, Each trial consisted of a self-paced choice between a sure option (on the left) and a risky gamble (on the right), followed by visual confirmation of the choice (a frame around the chosen option) and fixation. The sure amount in the next trial was adjusted based on the choice (increased if gamble was chosen, decreased if the sure option was chosen), with the gamble being fixed. After six choices, the sure amount that was reached provided an indifference point between the two options, defined as the certainty equivalent of the gamble. A new series of choices involving a new gamble was then started (in total, 10 gambles in the gain domain and 10 gambles in the loss domain). No feedback was provided on the outcome of the choices. B, The solid black line represents a typical probability weighting function, with overweighting of low probabilities and underweighting of moderate to high probabilities. The dashed diagonal line represents neutrality with regard to sensitivity to probabilities. Dopamine has been linked to pathological gambling (PG, also called gambling disorder), an addictive disorder characterized by excessive financial risk-taking in the face of negative consequences. Initial evidence for the role of dopamine in PG came from the clinical observation that a subset of patients with Parkinson's disease develop PG symptoms after receiving dopaminergic replacement therapy, in particular dopamine D2/D3 receptor agonists with high affinity for D3 receptors (Voon et al., 2009; Seeman, 2015). This concurs with recent evidence showing that PG is characterized by a hyper-dopaminergic state (Boileau et al., 2014; van Holst et al., 2017), and the prominent role of dopamine D3 receptors in human and rat models of PG (Payer et al., 2014; Lobo et al., 2015). However, the specific mechanisms through which dopamine D2/D3 receptor activity may act to foster PG remain elusive. In our previous study (Ligneul et al., 2013), pathological gamblers showed an elevation in their probability weighting function compared with healthy controls, reflecting an increased preference for risk or “optimism bias” in the gain domain (Gonzalez and Wu, 1999). Based on this observation, we aimed to test whether sulpiride, a selective dopamine D2/D3 receptor antagonist, could normalize risk-taking behavior in pathological gamblers, by decreasing the elevation of subjective probability weighting. To test the above hypotheses, we conducted a pharmaco-behavioral study using a within-subject counterbalanced design. pathological gamblers and healthy controls were asked to make choices between safe and risky options, both under placebo and sulpiride. Of note, feedback was not provided, to avoid potential learning effects and reinforcement-induced changes in choice strategy (Schonberg et al., 2011). We used prospect theory modeling to estimate subjective probability weighting and sensitivity to outcome value, separately in the gain and loss domains. Our main objective was to assess the effect of sulpiride on the two main characteristics of the probability weighting function, i.e., nonlinear distortion (sensitivity to changes in probability) and elevation (optimism bias). At a more exploratory level, we were also interested in comparing those effects in the gain and loss domains, given extensive literature showing differential effects of dopamine on gains versus losses (Frank et al., 2004; Pessiglione et al., 2006). We recruited 22 healthy controls and 22 pathological gamblers, all men, following an in-depth structured psychiatric interview administered by a medical doctor (MINI Plus; Sheehan et al., 1998). One gambler was excluded because his data were accidentally not written to the log file for one drug session. One control participant and five gamblers were excluded due to extreme behaviors violating core assumptions of prospect theory (for more details, see Statistical analysis). Therefore, the reported results are based on data from 21 healthy controls and 16 gamblers. The present task was part of a larger study for which the participants were paid €50 on each session. The other tasks in the study were a reversal learning task (Janssen et al., 2015), a slot machine task measuring sensitivity to near-misses (Sescousse et al., 2016), and a mixed gamble task measuring loss aversion. All participants provided written informed consent, which was approved by the regional research ethics committee (Commissie Mensgebonden Onderzoek, region Arnhem-Nijmegen). pathological gamblers were recruited through advertisement (N = 13) and addiction clinics (N = 3). None of the gamblers was in treatment at the time of testing, except for one who was just starting a cognitive behavioral therapy for his gambling problems. Control participants were recruited through advertisement. All gamblers, with the exception of one, qualified as pathological gamblers (⩾5 DSM-IV criteria for pathological gambling; American Psychiatric Association, 2000). One gambler qualified as problem gambler as he met only four DSM-IV criteria. The severity of gambling symptoms was assessed using the South Oaks Gambling Screen (SOGS; Lesieur and Blume, 1987). All gamblers had a minimum SOGS score of 6 (range, 6–18), whereas healthy controls, with the exception of two participants, had a SOGS score of 0 (range, 0–2). The two groups were matched for age, net income, body mass index, and verbal IQ (Table 1). Participants were excluded if they consumed more than four alcoholic beverages daily; were using psychotropic medication; had a lifetime history of schizophrenia, bipolar disorder, attention deficit hyperactivity disorder, autism, eating disorder, anxiety disorder, or obsessive-compulsive disorder; or had a major depressive episode in the preceding six months. Given the high comorbidity between pathological gambling and other psychiatric disorders (Lorains et al., 2011), gamblers with the following comorbidities were included in the sample: past cannabis dependence (more than five months; N = 1); lifetime history of dysthymia (N = 1); and remitted post-traumatic stress disorder (remitted more than four years; N = 1). One gambler had used cannabis weekly in the preceding six months but did not meet the DSM-IV criteria for abuse/dependence. The control participants did not have any history of substance abuse or dependence. A number of self-report questionnaires were further used to characterize the participants (Table 1). Participants were tested once after receiving a sulpiride pill (Dogmatil, 400 mg), and once after receiving a placebo pill filled with microcrystalline cellulose. The order of administration was randomized according to a double-blind, crossover design (placebo-sulpiride: 10 controls, eight gamblers; sulpiride-placebo: 11 controls, eight gamblers). The test sessions were separated by at least one week. Sulpiride was chosen as the dopamine-modulating drug in this study based on a few reasons. First, it is one of the most selective agents acting on dopamine D2/D3 receptors. As mentioned earlier, D2/D3 agents are known to cause pathological gambling symptoms in a subset of patients with Parkinson's disease. Moreover, sulpiride has been shown to modulate the sensitivity to reward and punishment during learning in human studies (Eisenegger et al., 2014; van der Schaaf et al., 2014). Background neuropsychological functioning, physiological measures and subjective mood were measured at several time points during the protocol to check for nonspecific effects of sulpiride; no such effects were observed. The risky decision-making task was performed ∼3 h 15 min after drug intake, thus coinciding with high plasma concentrations of sulpiride (von Bahr et al., 1991). We used a “certainty equivalent” procedure (Fig. 1A) based on the protocol developed by Abdellaoui et al. (2008, 2011). Participants made series of hypothetical decisions between a sure amount of money (either a gain or a loss) and a gamble (either a pure-gain or pure-loss gamble). In each series of decisions, the gamble was fixed and the sure amount was iteratively adjusted to converge toward a certainty equivalent corresponding to the sure amount that felt subjectively equivalent to the gamble. There were 10 series of decisions (i.e., 10 different gambles) in the gain domain and 10 series of decisions in the loss domain (Table 2). In each series of decisions, the sure amount offered on the first trial corresponded to the expected value of the gamble. On subsequent trials, the sure amount was adjusted based on the previous choice according to the bisection method (Abdellaoui et al., 2011), such that it was increased if the gamble was chosen and decreased if the sure option was chosen. This staircase procedure drove the participants toward their certainty equivalent, that is, the indifference point between the risky and safe options. The decision for each trial was self-paced, after which the participant’s choice was highlighted on the screen. Participants did not receive any feedback on their choice. Each series of decisions consisted of six trials, which is considered enough to provide reliable certainty equivalent estimates (Abdellaoui et al., 2011). In order to check for errors and random responses, each series ended with two control trials that required choosing between the gamble and a sure amount slightly above or below the estimated certainty equivalent. If the participant’s response was not consistent with previous choices, the series was repeated. Participants were not explicitly informed about these control trials. We checked that the number of repetitions was not significantly different between healthy controls and pathological gamblers (gain domain: Z = 0.55, p = 0.60; loss domain: Z = 1.31, p = 0.20), between the placebo and sulpiride drug conditions (gain domain: Z = 1.66, p = 0.098; loss domain: Z = 0.36, p = 0.72), or between gains and losses in general (Z = 1.47, p = 0.14). In total, participants went through a minimum of 160 experimental trials (10 series * [6 choices + 2 control trials] * 2 [gain/loss]). The task was the same in the loss domain but with negative amounts of money. Gain and loss trials were presented in separate blocks and the order of the blocks was counterbalanced across participants and drug sessions. The order of the specific gambles (Table 2) within gain and loss blocks was randomized. The task was performed on a computer and the task presentation was created with the Psychophysics Toolbox 2 (Brainard, 1997) for Matlab. We used the semi-parametric method introduced by Abdellaoui et al. (2008, 2011; see also Fox and Poldrack, 2014) to estimate the value and probability weighting functions of prospect theory. This procedure was employed separately for gains and losses and for the drug and placebo conditions, within each individual participant. To avoid local minima in our least squares estimations, we used an approach with randomized starting values. The two-step estimation procedure was run 200 times with starting values randomly drawn from [0, 5] for parameters α, δ, and γ, and from [0, 1] for w(2/6). The resulting prospect theory parameters with the smallest squared norm of the residuals (“resnorm”), reflecting the goodness-of-fit between the model and the data, were selected for the subsequent statistical analysis. Note that the resnorm values did not differ between drugs or groups for either of the two least square estimations (paired and independent t tests, respectively: all pcorrected > 0.2), suggesting that the average goodness-of-fit was comparable across drugs and groups. One control participant and four pathological gamblers were excluded from subsequent group analyses based on their certainty equivalents. For all these participants, the absolute value of their certainty equivalent was higher for Gamble 1 (x = ±€1200, p = 1/6) than for Gamble 10 (x = ±€1200, p = 5/6), in at least one of the four conditions of interest (gain/loss * placebo/sulpiride). This behavior violates the basic assumption of positive monotonicity in the evaluation of probabilities. One pathological gambler was further excluded due to extremely risk averse behavior (α value over three standard deviations away from the mean) that likely resulted from a fear of losing control and relapsing into compulsive gambling (as reported by the participant during debriefing). While the primary analyses were performed on the reduced sample resulting from these exclusions, we also performed analyses on the full sample to verify that our results were not distorted by our exclusion procedure (for details, see Results, Sensitivity analyses). Prospect theory parameters α, δ, and γ were compared across groups and drug conditions, separately in the gain and loss domains, using nonparametric statistics due to the non-normal distribution of the data. Main effects of the within-subject Drug factor were assessed using Wilcoxon tests. Main effects of between-subject Group factor were assessed using Mann–Whitney U tests, after parameters were averaged across drug sessions. 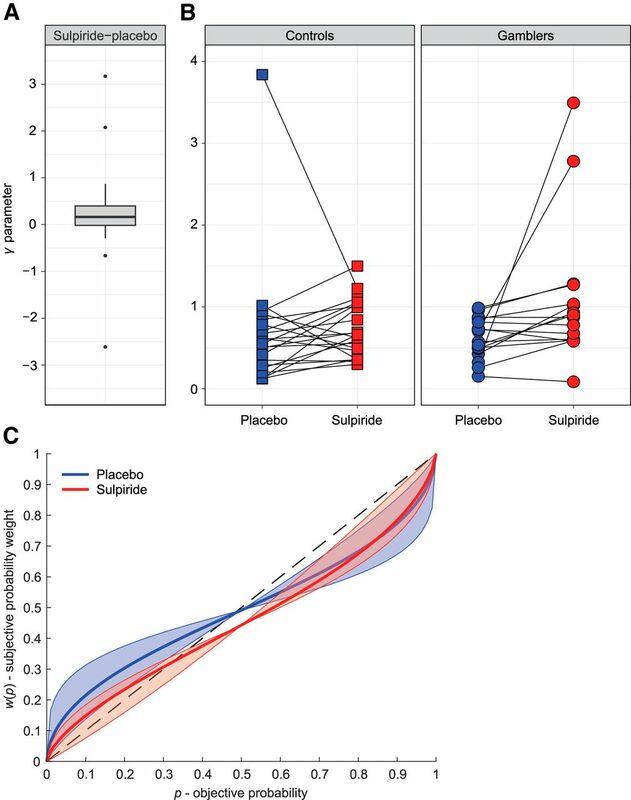 Drug-by-Group as well as Drug-by-Drug Order interactions were examined with Mann–Whitney U tests comparing sulpiride minus placebo values between groups. Bonferroni correction was used for the six comparisons performed for each dependent variable (parameters α, δ, and γ): the two main effects of Drug and Group as well as their interaction, times the two contexts (gains and losses). Therefore, the corrected p values correspond to the uncorrected p values multiplied by 6. For effect sizes, we use the Common Language Effect sizes (CLE; Wuensch, 2015; Grissom and Kim, 2012) for intuitive interpretation. For the Mann–Whitney U tests, the CLE was calculated as U divided by the product of the two groups’ sample sizes. For the Wilcoxon tests, the CLE was calculated as the number of positive differences (in favor of sulpiride over placebo) divided by the number of comparisons, that is, the total sample size. Therefore, the CLE represents the probability of a randomly selected value from one group/condition being higher than a randomly sampled value from the other group/condition. For both tests, there is no difference between the groups or conditions at CLE = 0.5. The data and code used to produce the reported results are available as Extended Data 1. The data and code can be found with DOI references and addresses doi.org/10.6084/m9.figshare.5311354 and doi.org/10.6084/m9.figshare.5311456, respectively. The code was run with a standard Windows 7 Professional 64-bit desktop computer (Intel Xeon CPU E5-1620, 16GB RAM), both with MATLAB R2013a and R2016a (RRID: SCR_001622). Raw data and MATLAB code for the prospect theory parameter estimation procedure implemented in the study. The code includes scripts for the main parameter estimation steps, parameter recovery, and checking the quality of the estimation. Download Extended Data 1, ZIP file. Table 3 reports group estimates for parameters γ, δ, and α in the study. A change in the distortion parameter γ of the probability weighting function represents a change in the nonlinear weighting of probabilities and thus the sensitivity to changes in probability. The distortion parameter γ did not significantly differ between control participants and pathological gamblers either in the gain domain (Z = 1.47, puncorr = 0.15, CLE = 0.64) or the loss domain (Z = −1.13, puncorr = 0.27, CLE = 0.39). However, there was a significant effect of the drug on γ in the gain domain (Z = 2.96, puncorr = 0.003, pcorr = 0.018, CLE = 0.70). Specifically, participants had higher values of γ under sulpiride (Mdn = 0.69) than under placebo (Mdn = 0.58), indicating lower levels of distortion of the probability weighting function in the sulpiride condition (Fig. 2). In the loss domain, there was no difference between placebo and sulpiride (Z = 0.36, puncorr = 0.72, CLE = 0.41). Drug effect did not interact with drug order in either the gain (Z = 1.46, puncorr = 0.15, CLE = 0.65) or the loss domain (Z = 0.58, puncorr = 0.58, CLE = 0.56), indicating no reliable session effects. The drug effect (sulpiride-placebo) was not significantly different between control participants and pathological gamblers in the gain domain (Z = 0.55, puncorr = 0.60, CLE = 0.55) or in the loss domain (Z = −2.02, puncorr = 0.044, pcorr = 0.26, CLE = 0.30). Figure 3 illustrates the shape of the probability weighting function separately for the gain/loss and placebo/sulpiride conditions in each group. Dopaminergic modulation of probability distortion. A, Boxplot illustrating the drug effect (sulpiride-placebo) on the distortion parameter γ of the probability weighting function in the gain domain, across all participants. Box height represents the interquartile range (IQR), black line represents the median, and whiskers represent the largest and smallest values no further than 1.5*IQR. Single data points are values located outside the whiskers. B, Within-subject paired observations of γ estimates in the placebo and sulpiride conditions for both experimental groups (different illustration of the result presented in Fig. 2A). C, Fitted probability weighting function, based on the median estimates of δ (elevation) and γ (distortion) parameters across all participants. The shaded areas illustrate the variance of γ across participants, with the boundaries corresponding to the probability weighting function plotted with median δ, and 25th and 75th percentile γ. A change in the elevation parameter δ of the probability weighting function represents a shift in the weighting of the entire probability range, thus reflecting overall optimism or pessimism about risk. The elevation parameter δ did not significantly differ between control participants and pathological gamblers either in the gain domain (Z = −1.41, puncorr = 0.17, CLE = 0.36) or in the loss domain (Z = −1.96, puncorr = 0.051, pcorr = 0.31, CLE = 0.31). Moreover, there was no significant effect of drug either in the gain domain (Z = −0.31, puncorr = 0.76, CLE = 0.43) or in the loss domain (Z = 0.39, puncorr = 0.70, CLE = 0.59). Finally, the drug effect (sulpiride-placebo) was not significantly different between control participants and pathological gamblers in the gain domain (Z = −0.74, puncorr = 0.48, CLE = 0.43) or in the loss domain (Z = 1.57, puncorr = 0.12, CLE = 0.65). For optimal comparison with our previous study, in which we found a group difference in δ in the gain domain (Ligneul et al., 2013), we further compared the groups in the placebo condition alone. This analysis did not reveal a significant group difference in δ in the gain domain (Z = 0.03, puncorr = 1.0, CLE = 0.50) but did reveal a significant difference in the loss domain (Z = −2.9, puncorr = 0.003, pcorr = 0.018, CLE = 0.22). Specifically, pathological gamblers had lower values of δ (Mdn = 0.42) than control participants (Mdn = 1.08), indicating lower elevation of the probability weighting function in the loss domain (Fig. 3C,D). Fitted probability weighting function based on group median estimates of δ (elevation) and γ (distortion). 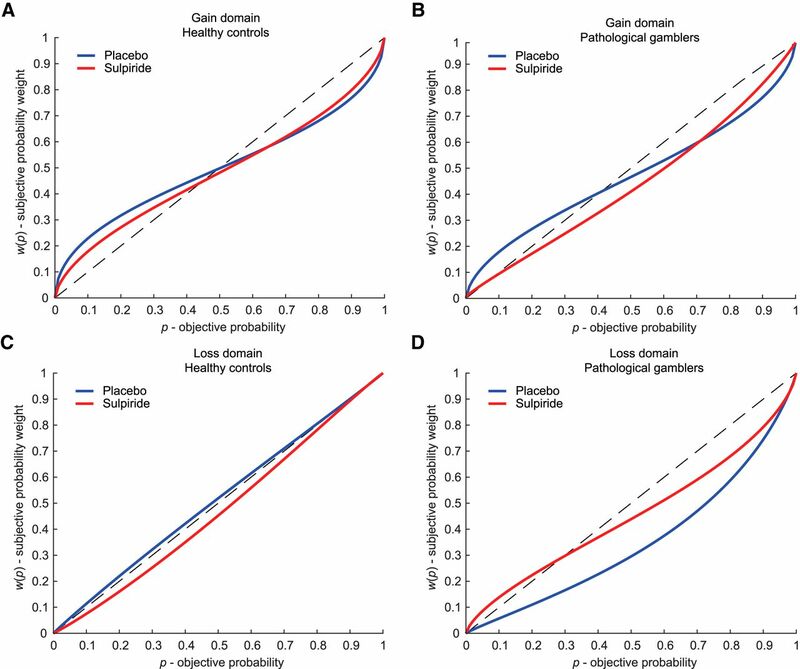 Across groups, sulpiride decreased probability distortion in the gain domain compared with placebo (A, B). When examining the placebo condition alone, pathological gamblers showed a decreased elevation of their probability weighting function in the loss domain compared with healthy controls (C, D). Since our procedure also enabled us to measure the curvature parameter of the value function, we also examined potential effects of group and drug on this parameter. Nonparametric tests indicated that there was no significant difference between control participants and pathological gamblers either in the gain domain (Z = 0.86, puncorr = 0.40, CLE = 0.58) or in the loss domain (Z = 1.17, puncorr = 0.25, CLE = 0.61). Moreover, there was no effect of drug in the gain domain (Z = 1.53, puncorr = 0.13, CLE = 0.62) or in the loss domain (Z = −1.21, puncorr = 0.23, CLE = 0.41). Finally, the drug effect (sulpiride-placebo) was not significantly different between control participants and pathological gamblers in the gain domain (Z = 1.96, puncorr = 0.051, pcorr = 0.31, CLE = 0.69) or in the loss domain (Z = −1.69, puncorr = 0.10, CLE = 0.34). To confirm the pattern of our main result on probability distortion, we performed an analysis of the probability weights themselves, which were obtained using a semi-parametric procedure, as opposed to the parametric estimation of γ. Specifically, we performed a 2 (groups) × 2 (drugs) × 5 (probability levels: 1/6, 2/6, 3/6, 4/6, and 5/6) ANOVA on the probability weights w(p) in the gain domain. We observed a significant interaction of drug and probability level on the w(p) (F(2.7,94.495) = 3.21, p = 0.031, η 2 = 0.084), thus strengthening our main result that sulpiride differentially modulates small versus medium-to-large probability weights. However, matched samples post-hoc t tests between the w(p) for the two drug conditions failed to reach significance (w(1/6): t(36) = 1.15, p = 0.26, w(2/6): t(36) = 1.39, p = 0.17, w(3/6): t(36) = 0.62, p = 0.54, w(4/6): t(36) = −0.15, p = 0.26, w(5/6): t(36) = −1.41, p = 0.17). The parameters δ and γ have the same interpretation as in the Lattimore function, except that the degree of elevation decreases when the parameter δ increases. When the same analysis was conducted on the parameter estimates obtained with the Prelec function, the drug effect on the distortion parameter γ remained significant (Z = 2.71, puncorr = 0.007, pcorr = 0.032, CLE = 0.70), emphasizing that sulpiride decreases the distortion of the probability weighting function (i.e., increases the parameter γ) compared with placebo. In addition, the drug effect on the distortion parameter γ remained significant (Z = 2.96, puncorr = 0.003, pcorr = 0.018, CLE = 0.70) when we used a linear value function (α = 1) instead of a power function (xα), a common assumption we made in our previous study (Ligneul et al., 2013). Furthermore, using the original analysis with the power and Lattimore functions, the drug effect on the distortion parameter γ remained significant when we excluded the one participant with past cannabis dependence (Z = 2.83, puncorr = 0.005, pcorr = 0.030, CLE = 0.69). It also remained significant when we included all possible participants, i.e., when none of the participants were excluded based on behavioral criteria, leading to 22 healthy controls and 21 pathological gamblers (Z = 3.50, puncorr = 0.00046, pcorr = 0.0028, CLE = 0.72). However, the group effect on the elevation parameter previously observed in the loss/placebo condition did not remain significant when all participants were included, Z = −2.6, puncorr = 0.009, pcorr = 0.054, CLE = 0.27. Finally, to assess the accuracy of the parameter estimation, we ran a parameter recovery procedure (Heathcote et al., 2015). First, we used the parameter values from the original estimation to simulate new data. Specifically, we generated synthetic certainty equivalents for every gamble (i.e., 10 gambles in the gain the domain and 10 gambles in the loss domain) for each participant and each drug condition, using Equation 2. From there we created 200 noisy synthetic datasets by adding normally distributed noise to these synthetic certainty equivalents; following standards in the field, the standard error of the noise was set to be the median (over all participants and conditions) of the root-mean-squared error between the original and simulated values. We then used these noisy synthetic datasets in combination with the previously described semi-parametric procedure (Abdellaoui et al., 2011), to perform 200 estimations of w(2/6), α, δ, and γ parameters. Across-subject correlation coefficients between the original and the recovered parameter values (defined as medians over the 200 simulations) were above 0.95 for all parameters in all conditions, indicating efficient parameter recovery and high accuracy in the original parameter estimation. Our main result indicating a significant drug effect on the distortion parameter γ showed an even larger effect size with the recovered parameter values (CLE = 0.76) than with the original parameters (CLE = 0.70). This study investigated the effect of a dopaminergic manipulation on probability weighting during risk-taking in pathological gamblers and healthy participants. In line with our first hypothesis, we found that blocking dopamine D2/D3 receptors attenuated probability distortion in the gain domain. However, in contrast to our second hypothesis, the elevation of the probability weighting function was not affected by the dopaminergic manipulation and did not differ between pathological gamblers and healthy controls in the gain domain, although a group difference was observed in the loss domain under placebo. Similarly, we did not find evidence for differences in sensitivity to outcomes between pathological gamblers and healthy controls, as well as no effect of the drug on the sensitivity to outcomes. Our results demonstrate that the degree of nonlinear probability weighting during decision-making is modulated by dopamine. More specifically, blocking D2/D3 receptors decreased probability distortion in the gain domain; this made participants more linear, or rational, in their overall assessment of probabilities, and thus more sensitive to changes in probabilities in the medium range. Such a differential effect of a dopaminergic agent on low versus high probabilities is consistent with several previous studies. First, it is remarkably consistent with a recent study that used a similar paradigm and similar drug (amisulpride), and showed that the selective blockade of D2/D3 receptor with amisulpride led to a similar decrease in probability distortion during risky decision-making (Burke et al., 2017). In another study, Norbury et al. (2013) showed that, in low sensation-seeking participants, the dopamine D2/D3 receptor agonist cabergoline increased risk-taking for high winning probabilities, while decreasing it for low winning probabilities. Similarly, Stopper et al. (2013) have shown that the administration of a dopamine D1 receptor agonist increased risk-taking behavior of rats in the context of high winning probabilities but decreased it in the context of low winning probabilities. Interestingly, in all these studies including ours, the interaction of dopaminergic drug effects with probability level led to more rational behavior maximizing long-term expected value. Thus, it could be that, instead of, or in addition to, inducing a shift in risk taking, modulating dopamine might induce a shift in the adherence to the principle of expected value maximization. This is an intriguing hypothesis that would deserve to be formally tested in future studies. Particularly relevant for the current study is the work of Takahashi et al. (2010), which to our knowledge is the only study with Burke et al. (2017) to have explicitly investigated the role of dopamine in probability weighting. In their PET study, Takahashi et al. (2010) reported that lower dopamine D1, but not D2, receptor binding in the striatum was associated with higher levels of probability distortion. This seems partly at odds with the current results, which suggest that that D2 receptor stimulation also plays a role in probability weighting. One possibility is that the drug effect observed in the current study could reflect a change in the balance between D1 and D2 receptor-mediated activity in the direct and indirect pathways of the basal ganglia, respectively, with sulpiride-induced D2/D3 receptor blockade being associated with a shift toward D1 receptor-dependent Go-pathway activity (Frank and O’Reilly, 2006; Jocham et al., 2011; van der Schaaf et al., 2014). Note that the stimulation of low affinity D1 receptors could have been further amplified by the use of a relatively low dose of sulpiride (400 mg), which may also act on presynaptic auto-regulatory D2 receptors and thus increase dopamine release (Frank and O’Reilly, 2006). Accordingly, we observed that sulpiride-induced D2/D3 receptor blockade decreases distortion, which is in line with the observation of Takahashi et al., that higher D1 receptor binding in the striatum is associated with less distortion. A number of previous studies have shown that dopaminergic manipulations induce a global shift in risk attitudes, i.e., they either increase or decrease risk taking, both in humans (Riba et al., 2008; Djamshidian et al., 2010; Rutledge et al., 2015; Rigoli et al., 2016) and animals (St Onge and Floresco, 2009; Zeeb et al., 2009; Cocker et al., 2012). As mentioned previously, the lack of such an effect in our study could stem from the fact that, in contrast to most of these studies that only manipulated one probability (or a limited range of probabilities), we considered the whole range of probabilities and observed opposite effects for high and low probabilities. Another distinctive feature of our experimental design is the absence of monetary feedback, which was chosen to avoid contamination of the decision-making process by previous outcomes (Schonberg et al., 2011). This is important since risk attitudes, in particular probability distortion, have been shown to differ when making decisions from description, as is the case in our study, versus from experience, i.e., based on feedback (Hertwig and Erev, 2009). In addition, recent evidence in rats suggests that the influence of the dopamine D2 pathway on risky behavior is exerted via the signaling of prior outcomes (Zalocusky et al., 2016). Thus, the absence of feedback in our task could explain why the blockade of dopamine D2 receptors failed to produce a global effect on risk attitudes. Interestingly, the vast majority of human studies reporting a global shift in risk-taking following a dopaminergic manipulation have used dopamine-enhancing agents such as L-Dopa. Thus far, we are aware of only one study (Burke et al., 2017) reporting similar effects following dopamine D2/D3 receptor blockade. We were not able to replicate our previous result showing an elevation of the probability weighting function in the gain domain (i.e., increased preference for risk) in pathological gamblers compared with healthy controls (Ligneul et al., 2013). One important methodological difference is that the monetary amounts used in the current study were much higher than in our previous study (€300–€1200 vs €2–€20). It has been observed that people tend to be more risk seeking for low-stake gambles than large-stake gambles, an observation referred to as the “peanuts effect” (Prelec and Loewenstein, 1991; see also Weber and Chapman, 2005). It is possible that the gamblers in our previous study were particularly sensitive to the peanuts effect and engaged in particularly high risk-seeking behavior in the presence of low-stake gambles. It is also possible that the control participants in the current study happened to be more risk seeking than on average. A qualitative comparison of median values for the elevation parameter in the gain domain (Ligneul et al., 2013: δControls = 0.74, δGamblers = 1.03; current study: δControls = 0.99, δGamblers = 0.90) with typical values reported in the literature (Fox and Poldrack, 2014, their Table A.3: median δ = 0.77) lends credence to these hypotheses: it seems that the control participants in the current study were more risk seeking than on average, while the gamblers were less risking than in our previous study. Another difference is that we assumed a linear value function in our previous study, whereas in the current study we estimated the value function empirically based on the certainty equivalents. Given the trade-off between prospect theory parameters α (curvature parameter of the value function) and δ (elevation parameter of the probability weighting function) in accounting for risk attitudes (Fox and Poldrack, 2014), it could be that part of the risk-seeking behavior was absorbed by the α parameter in our current modeling procedure, whereas all of it was absorbed by the δ parameter in the previous study. Note however that our present results remained qualitatively unchanged when the estimation procedure was run with a linear value function, that is, we did not observe group differences in the probability weighting function when using either the linear or power forms of the value function. While no group difference was observed in the gain domain, analyses restricted to the placebo condition revealed that, in the loss domain, pathological gamblers showed a significant decrease in the elevation of their probability weighting function compared with heathy controls (Fig. 3C,D). This observation implies a general underweighting of losing probabilities, which could contribute to the optimism bias and excessive risk-taking behavior observed in pathological gamblers. However, given that this result was not predicted and only applies to the placebo condition, we prefer to refrain from speculating further before it is replicated. This study is not without its limitations. First, we had a modest sample size, partly due to the complexities of running pharmacological studies in patients, and the exclusion of several participants based on outlying behavior and violations of basic prospect theory assumptions. Yet, to mitigate the increased likelihood of false positives (Poldrack et al., 2017), we implemented stringent Bonferroni correction for multiple comparisons and demonstrated the convergence of results across various sensitivity analyses. It should also be noted that our sample was exclusively composed of men, and that further study is necessary to assess whether our results generalize to women, especially given previous evidence of gender differences in probability weighting (Fehr-Duda et al., 2006). Another limitation is the moderate test-retest reliability of decision-making measures in addictive disorders such as pathological gambling (Kräplin et al., 2016). This might have limited our ability to replicate our previous result on the elevation of probability weighting (Ligneul et al., 2013) and more generally our ability to uncover true differences between groups or drug conditions. Furthermore, individual risk preferences have been shown to vary substantially across tasks, a phenomenon known as the “risk elicitation puzzle,” partly attributable to inconsistent decision strategies across tasks (Pedroni et al., 2017). This observation warrants some caution regarding the generalizability of the present findings, which could in part be driven by the specific demands of the task that we used. In particular, using a more ecological gambling task might have revealed clearer differences in risk-taking between pathological gamblers and healthy controls (Schonberg et al., 2011). In summary, this study provides evidence supporting the hypothesis that modulating dopamine affects how humans weight winning probabilities during decision making. Dopamine D2/D3 receptor antagonism shifts probability weighting in the direction of more objective, economically rational decision making. In future studies, it will be important to replicate this result and further compare the contributions of D1 and D2/D3 receptors with the same method, since the effect has now been observed in relation to both receptors (Takahashi et al., 2010). Acknowledgements: We thank Romain Ligneul, Payam Piray, Bram Zandbelt, and Filip Melinščak for helpful discussions on data analysis and visualization. G.S. was supported by a Veni grant from the Netherlands Organisation for Scientific Research (NWO). American Psychiatric Association (2000) Diagnostic and statistical manual of mental disorders: DSM-IV-TR (4th ed., text rev.). Washington, DC: Author. Boileau I, Payer D, Chugani B, Lobo DSS, Houle S, Wilson AA, Warsh J, Kish SJ, Zack M (2014) In vivo evidence for greater amphetamine-induced dopamine release in pathological gambling: a positron emission tomography study with [(11)C]-(+)-PHNO. Mol Psychiatry 19:1305–1313. Burke CJ, Soutschek A, Weber S, Beharelle AR, Fehr E, Haker H, Tobler PN (2017) Dopamine receptor-specific contributions to the computation of value. Neuropsychopharmacology, in press. Fox CR, Poldrack RA (2014) Appendix: prospect theory and the brain. In: Neuroeconomics: decision making and the brain ( Glimcher PW, Camerer CF, Fehr E, Poldrack RA , eds), pp 533–567. New York: Academic Press. Grissom RJ, Kim JJ (2012) Effect sizes for research: univariate and multivariate applications. Routledge: New York, NY. Heathcote A, Brown SD, Wagenmakers E-J (2015) An introduction to good practices in cognitive modeling. In: An introduction to model-based cognitive neuroscience ( Forstmann BU, Wagenmakers E-J , eds), pp 25–48. New York: Springer New York. Sheehan D, Lecrubier Y, Harnett-Sheehan K, Amorim P, Janavs J, Weiller ETH, Hergueta T, Baker RDG, Dunbar G (1998) Diagnostic Psychiatric Interview for DSM-IV and ICD-10. Journal of Clinical Psychiatry 59:22–33. Timmer MHM, Sescousse G, Esselink RAJ, Piray P, Cools R (2017) Mechanisms underlying dopamine-induced risky choice in Parkinson’s disease with and without depression (history). Comput Psych 2:11–27. van Holst RJ, Sescousse G, Janssen LK, Janssen M, Berry AS, Jagust WJ, Cools R (2017) Increased striatal dopamine synthesis capacity in gambling addiction. Biol Psychiatry, in press. Wuensch K (2015) CL: The Common Language Effect Size Statistic. Retrieved from http://core.ecu.edu/psyc/wuenschk/docs30/CL.pdf on the 6th of July, 2017. I believe the authors did an excellent job responding to their previous reviewer feedback. I am personally impressed by their behavioral approach and the advanced behavioral analysis. A dose-response assessment would be nice, but the pharmacological component is satisfactory at this point. I only have one major concern regarding data interpretation that I believe should be addressed in the discussion. As they should be, the respective contributions of striatal dopamine D1 and D2 receptors to risky decision making are discussed around line 359 in the discussion. While important, the authors should clearly state that D2 antagonists not only block post-synaptic D2; they also block pre-synaptic D2 autoreceptors. The latter pharmacodynamic effect is well documented to increase dopamine release in the striatum, which could theoretically lead to greater occupancy of low-affinity D1 receptors, etc. I am not asking for a long speculative discussion; but, I do believe it is necessary to acknowledge that sulpiride would not only block post-synaptic D2, but also increase dopamine concentration in the striatum via action on pre-synaptic D2---which complicates the neuropharmacological mechanisms that are modifying probabilistic decision making. from my perspective: D2Rs, both post and pre, are blocked; dopamine concentrations should be higher as a result of presynaptic D2 antagonism (clearly shown in literature); more of the relatively lower affinity D1Rs should be occupied as a result. In this revision the authors appear to have conscientiously addressed the concerns from the prior review. It is of great interest that the authors did not find differences in the effect of sulpiride in controls and pathological gamblers. This finding has the potential to be useful to the field, as long as the various caveats to this study are clearly stated by the authors to aid the reader in interpretation. On this point, and to their credit, the authors do a pretty good job. They do mention the possibility that the control group showed generally riskier behavior than average non-pathological gambling individuals. The authors also mention that their particular task may have led to the lack of a group difference in drug effect. Of particular note is that choices were not reinforced. It seems relevant to emphasize this in the introduction when the experimental design is described. The authors should take care to not assume the behavioral mechanisms are the same in reinforced and unreinforced choice procedures. In summary, the paper could be improved by enhanced attention to the need to clarify the possible caveats to this study, but other than that, I have no issues.